This program is specifically designed for Ultimate Drum Samples and Absolute Drum Samples DVDs. The text refers to Ultimate Drum Samples edition, but the same principles apply to the version for Absolute Drum Samples. Since there are 6000 individual sounds on the Ultimate Drum Samples DVD, its primary goal is to organize the multitude of available drum samples. This application makes it easy to organize the sounds by various criteria (such as drum type, hit type, hit volume etc.) and allows you to pick the right sounds conveniently and without too much effort. You can easily play the available sounds, select those you would like to use and then export them to a specified folder. During the exporting process the sample may be assigned a new name using selected attributes, converted to desired format etc. After finishing the process, you can take samples from the export folder and use it as you wish, without any problems as they are named in a way that makes sense for your current needs. 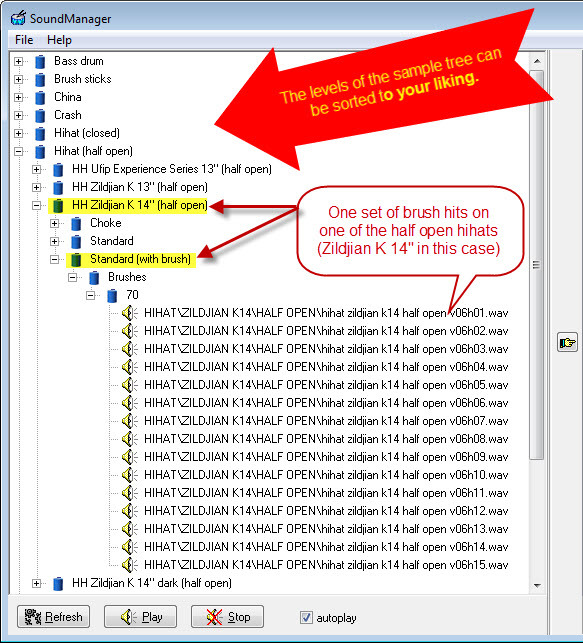 For example, if you would wish to find some sounds of half open hihat played with brush sticks, the situation would look like shown in the image (only left part of the main program windows is shown). Please note that that various levels of the samples tree can be sorted, added or removed according to your needs (via File/Options). The sounds you wish to use need to be selected and placed in the list box in the right side of the windows. You can also copy and use the sounds directly from the DVD, according to the file path shown. The sounds are originally recorded in 24-bit 44100 Hz format and saved as 32-bit floating point WAV files. If your specific application calls for 16-bit samples, you can easily convert them to this format by checking the appropriate checkbox. Copyright (c) 2011 AEON GROUP spol. s r.o. All rights reserved.